Home » SEO blog » Content SEO » What is a snippet? SEO basics: What is a snippet? The snippet is a single search result in a set of search results and generally consists of a title, a URL and a description of the page. The content of a snippet matches parts of the search query and you’ll see your keyword highlighted in the snippet description. Search engines often use pieces of your content to fill in the parts that make up the snippet. In most cases, search engines determine the best possible snippet for you, but you can try to override that by adding a meta description to your page. In this post, we’ll dive deeper into what is a snippet. I'd generally recommend specifying one, you know your content best. The snippet in the screenshot you saw at the beginning of this article is a regular, static snippet but there are many variations to be found. Search engines love to experiment with different ways of highlighting particular results within the search results pages. For some time now, we’ve seen rich results appear in different forms. Rich snippets are regular snippets with added information, like product details, availability, reviews and a lot more. Here’s a rich snippet for the search term [Fender Standard Precision Bass sunburst]. You’ll notice that this snippet is much ‘richer’ so to say. It has ratings, review, pricing, stock availability and some product highlights. This is a specific product rich snippets, but there are similar snippets for recipes, reviews, videos, events, courses and much more. Adding structured data is a necessity for some types of these rich results. Another type of snippet is the featured snippet. This is a new kind of result that appears at the top of the search results pages, even before the first organic search result — at position 0 so to say. The content for these featured snippets comes from pages that best answer that specific question in its content. You can’t sign up for this — you have to earn it with your content. 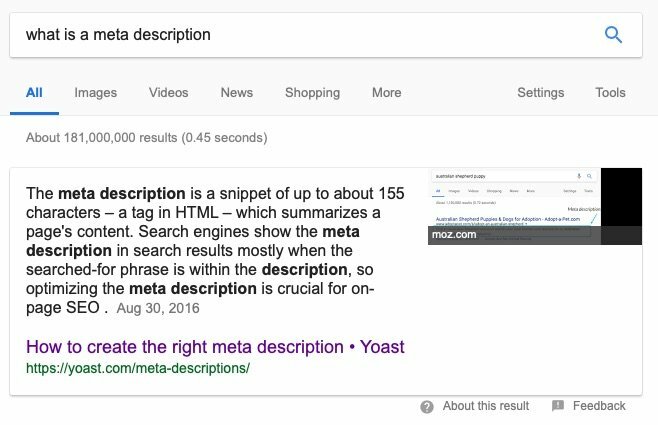 Here’s one of our featured snippets, this one for the search term [what is a meta description]. This feature snippet takes the full answer to that question from our article and puts it right at the top of the page. Earlier, I pointed out that search engines sometimes prefer to pick their own text from a website to use in the snippets. While they are pretty apt at making up something nice, in a lot of cases you’d probably want to control how your page appears in search. One of the ways you can influence this is by adding a meta description to your page. This is a short piece of text describing your content in a way that makes it attractive for both searchers as well as search engines. You can also edit the SEO title of your article if you want to override the standard way search engines show your page title. 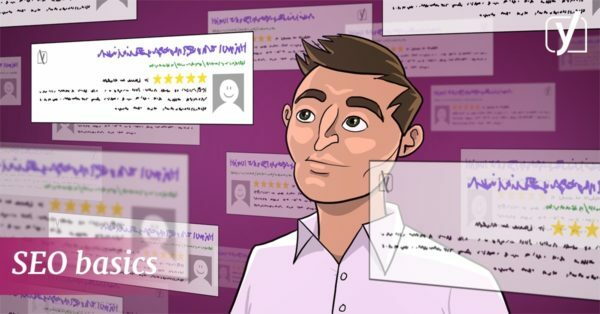 Yoast SEO helps you do all this. 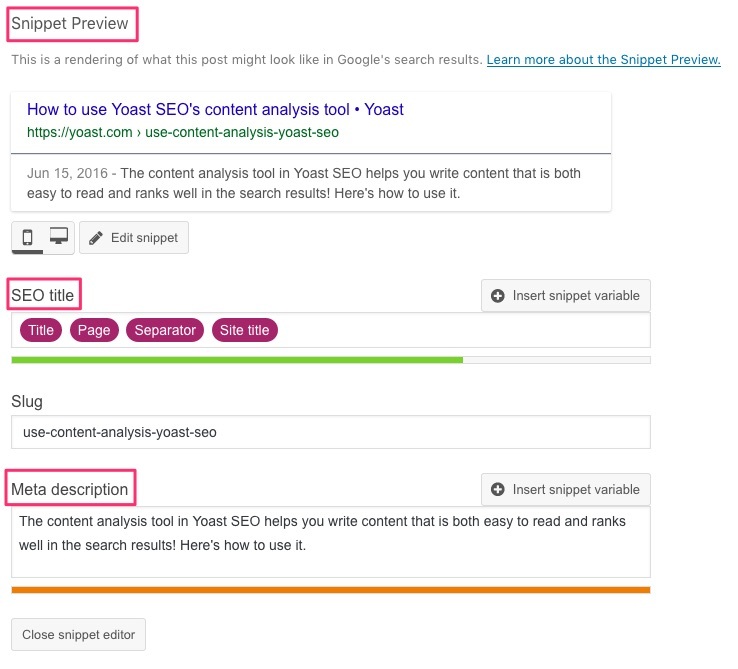 The snippet preview in Yoast SEO gives you a good idea of how your post or page might look like in search engines. Also, you can edit the SEO title if you want it to be something else then your regular page title. If you want you can use variables, so you can automate stuff. You’ll also find the meta description field in which you can add the text you want to suggest to search engines to use. Learn how to make your site stand out in search results and how to write an awesome meta description. A snippet is a deceptively simple thing: a single search result. However, it has great power. A good snippet will help you get those clicks. You don’t just want to appear at the top of the search results, no, you want those clicks! And to get people to click, you need a brilliant snippet. 6 Responses to What is a snippet? I am a digital marketer by profession and have been working in a travel agency for last nine months. I was not fully confident on my SEO skills and I was to search the web for the info and I got this site. After reading the whole article I optimised my site. It is the first time when the yoast seo plugin has shown everything okey. That’s great, Ranbir! Happy we could help and good luck with optimizing your site further! Be nice to create featured snippets as part of the Yoast plugin. Thanks for sharing, it gives me some ideas what to work on. I have a doubt. Someone suggested using a plugin to create a rich card in WordPress. 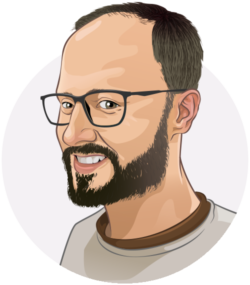 Is that necessary or Yoast will do the same? I asked because I checked the search console structured data and found the same result is showing with and without the plugin, no errors. Wow! What a detailed post about Snippet! The snippet is as effective as the whole content. So crafting powerful and emotional snippet plays a vital role in getting top ranking and traffic.